I would have to be one of happiest people on earth tonight. Sue was finally taken out of Intensive Care today and is now in the Neurological Ward at St Vincents Hospital. We went to visit her tonight and when we got there she was sound asleep, still with some drips attached to her tired frail body. The nurses asked us to step out for a while so they could reposition her in the bed. After about 10mins we went back into her room and to our sheer delight she was awake and very aware of who we were. Although she is not speaking as yet she smiled, nodded and made some small facial gestures as we spoke to her. Thank you for everyone out there and the universe for your prayers in getting my Suzie back. Even though it will probably be a long road at least we are heading in the right direction. Even though there have been a lot of tears this past week tonight's happy tears were the sweetest I have ever tasted. I now feel I can share some of my photos from Bali - I just couldn't get my brain to think of anything else until now. While we 8 girls were in Bali 5 of us decided to get a tattoo. When Sue and I turned 50 we decided to get ourselves a tattoo - she got a Chinese water symbol - she is a typical Aquarius and very attached to water. I got mine on my ankle, it is my initials and I designed it myself. 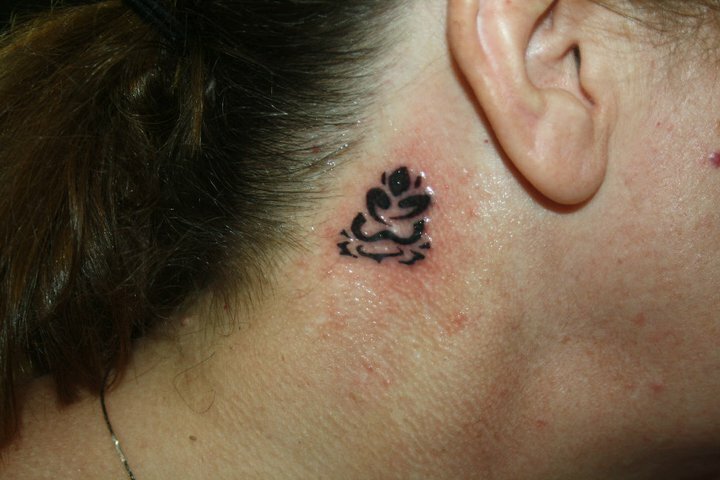 As most of you would know I am a bit of a crazy person when it comes to Buddhas so I felt I had to get a Buddha tattoo - but what design. Finally I found a drawing of the "Lotus Buddha" and decided this was to be my gift to myself. The next decision was to the position. Considering that you should never get a tattoo of Buddha below your waistline I decided to get my tattoo behind my ear - yes you heard right - behind my ear. It didn't really hurt, just vibrated in my head a lot. I got Alice to hold my head when the tattooist first started because I didn't want to move. But all was OK and I love it and I don't feel I need any more. Here we got - ready or not!!! Now that wasn't to bad. I am extremely happy to hear that your sister is on the mend, I shall thank the Creator for this tonight! Are you nuts? lol A tattoo behind the ear, I can't even imagine! I got the one on my ankle and that was bad enough. I like the tattoo and all but I can't even imagine allowing someone to put a needle anywhere near that spot on me! You're much braver than I am my friend, looks awesome! Hugs sent out your way from across the miles. GREAT news about Susan! And I'm still sending prayers her way. Nice tattoo-- I'm a chicken and don't have one but this looks terrific. Hi there Davine, haven't seen you here in a while, I hope that all is well in your world and that Sue has made progress. I'm keeping you all in my prayers. Take care and huge hugs sent your way. I'm glad she's doing better. I just saw this so I will keep her in our prayers.